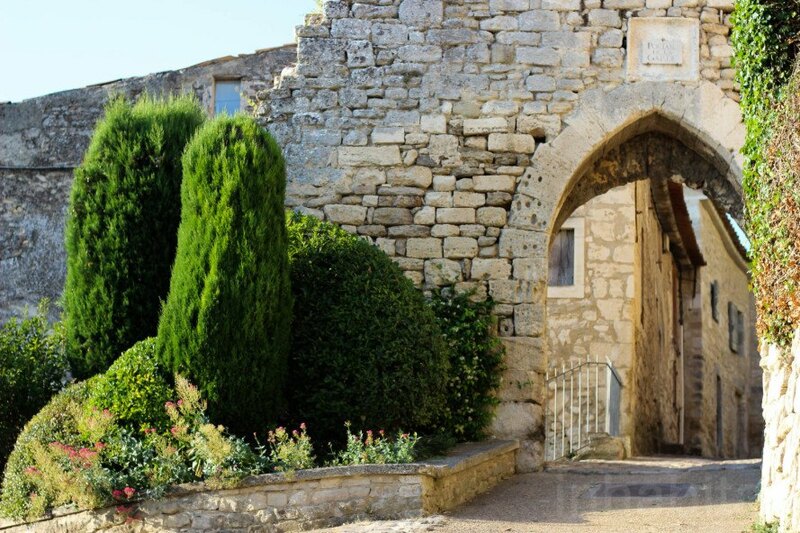 A medieval village in the south of France that once lay in ruins from war and neglect has been brought back to life as a flourishing community for art students of the Savannah College of Art and Design (SCAD). Known as SCAD Lacoste, its story of adaptive reuse is impressive, but it’s the combination of incredible historic preservation with cutting-edge technology and contemporary arts that makes the scenic campus extraordinary. With its layers of history and rustic buildings that date back to the ninth century, this pastoral haven of the arts continues to turn up surprising secrets from the past. 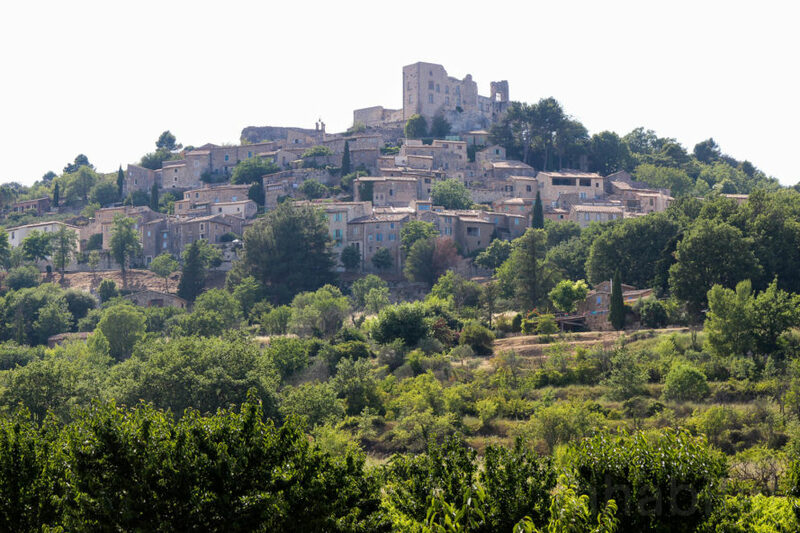 Once the stomping grounds of Celtic tribes, Roman armies, and famed painters like Henri Matisse and Pablo Picasso, this tiny village made from stone has enjoyed a colorful history thanks to its location along the ancient La Via Domita, the first paved trade route that passed through the Luberon Valley to link Italy and Hispania. The cluster of stone structures clings to a hillside overlooking spectacular valley vistas of lavender fields and the Luberon ranges. Like an open-air museum, the village is filled with physical reminders of its rich history, from its massive fortification walls built during religious and territorial battles to the still-visible 17th century dates etched into keystones and window frames during the village’s building boom in the 1600s. The village of Lacoste survived the French revolution of the late 18th century—though the infamous Marquis de Sade’s Lacoste chateau was destroyed in the riots—and continued to expand into the late 19th century, however, suffered terribly during the two World Wars when it was used to harbor the Resistance. The construction revolution during the 1950s and 1960s dealt another heavy blow, as skilled laborers and their families abandoned the village for the city. Fortunately, American artist Bernard Pfiem fell in love with the Lacoste ruins in the 1950s and purchased the derelict buildings for a pittance—around $500 for twenty-odd structures—transforming the village into the Lacoste School of the Arts in 1970. Pfriem waxed poetic on the location: “Lacoste’s remoteness, isolation, and even primitiveness force all of us to face ourselves and our own resources as artists. This is a vital experience for the creative person, as important as the rich awesome novelty of responding to a foreign culture and landscape.” International visiting artists flocked to the campus, however, after the death of Pfriem in 1996, the village fell into decline once more until it caught the eye of the Savannah College of Art and Design. In 2002, the Lacoste School of the Arts donated their eighteen properties to SCAD, which set off on an ambitious community effort to restore and renovate the buildings, much of which lacked modern plumbing and electricity and some of which were completely uninhabitable. SCAD preservationists, alumni, staff, and students worked alongside local masons and specialists to restore the village and sensitively transform the buildings into artist studios, classrooms, offices, and dormitories. Rather than dive headfirst into structural repairs, SCAD first developed a comprehensive plan that addressed the needs of the campus and community, climatic concerns, and long-term growth. At the heart of the plan was a desire to make the village’s rich history a tangible experience as opposed to a sterile museum-like environment. One great example of their success is the adaptive reuse of the 1840s boulangerie located at the heart of the village into SCAD’s library, which continues the boulangerie’s purpose as the “village hearth” and gathering space. The boulangerie’s beehive oven is turned into a reading nook and books on all SCAD subjects line the walls. 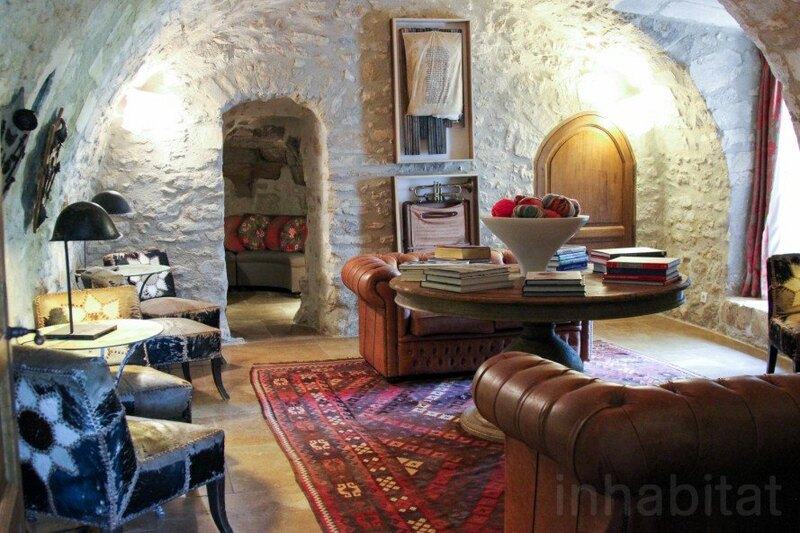 On Rue Basse, the main cobblestone road of Lacoste, sits the Olivier Caves, medieval caves that have been restored and outfitted into working studios for artist residences to carry on Provence’s great atelier tradition. Currently in its fourteenth year, the magical and well-preserved Lacoste village has already welcomed thousands of students and visitors but its historic preservation and restoration efforts are far from finished. New discoveries continue to be made with every excavation, from unearthed 3rd century Roman glass relics to sprawling underground tunnels beneath Rue Basse. SCAD has thus far restored over 30 buildings, though the number is not exact since many structures are merged together and unexpected rooms and spaces are uncovered during restoration work. Traditional building methods and locally quarried Luberon stone are used in repairs wherever possible. While the village’s architectural character is preserved and respected, SCAD injects new life into the stone buildings with colorful lush landscaping and contemporary student artwork that tastefully punctuate Lacoste. Perhaps the best place to see the confluence of contemporary art and historic preservation is in Maison Basse, a former farmhouse in the valley that is SCAD’s most extensive restoration project to date. The building, which houses a cafeteria, living rooms, studios, and student housing, features a tasteful and elegant mix of local vintage furnishings, historic relics found on site, and SCAD artwork in every room. SCAD Lacoste invites no more than eighty SCAD students to study at the beautifully preserved medieval village every quarter. Visitors in Provence are also free to visit the grounds and attend guided tours. Modern amenities, such as plumbing, electricity, WiFi, computer labs, and more have all been integrated into the campus without disturbing the historic character. Adaptive reuse is a core theme found throughout not just on the Lacoste campus, but also on all SCAD campuses including those in Atlanta, GA; Savannah, GA; and Hong Kong. 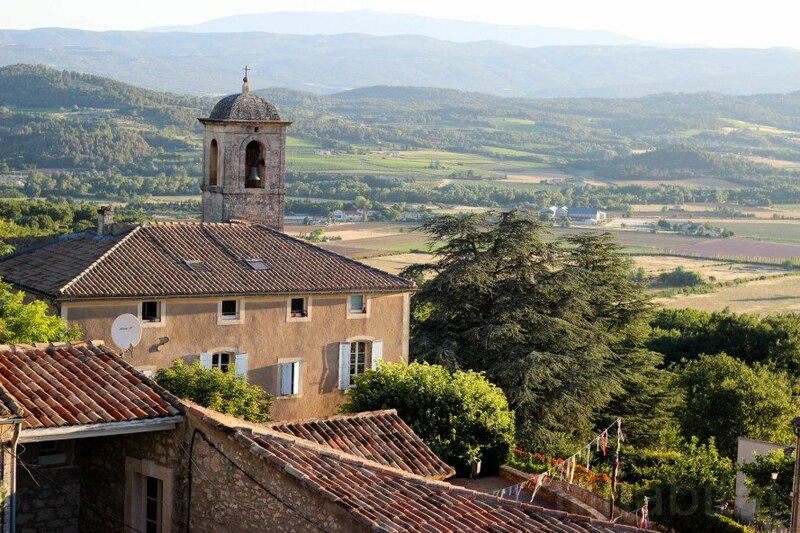 Once the stomping grounds of Celtic tribes, Roman armies, and famed painters like Henri Matisse and Pablo Picasso, this tiny village made from stone has enjoyed a colorful history thanks to its location along the ancient La Via Domita, the first paved trade route that passed through the Luberon Valley to link Italy and Hispania. The cluster of stone structures clings to a hillside overlooking spectacular valley vistas of lavender fields and the Luberon ranges. SCAD preservationists, alumni, staff, and students worked alongside local masons and specialists to restore the village and sensitively transform the buildings into artist studios, classrooms, offices, and dormitories. Artists such as Pablo Picasso reportedly flocked to the area to paint in its beautiful northern light. 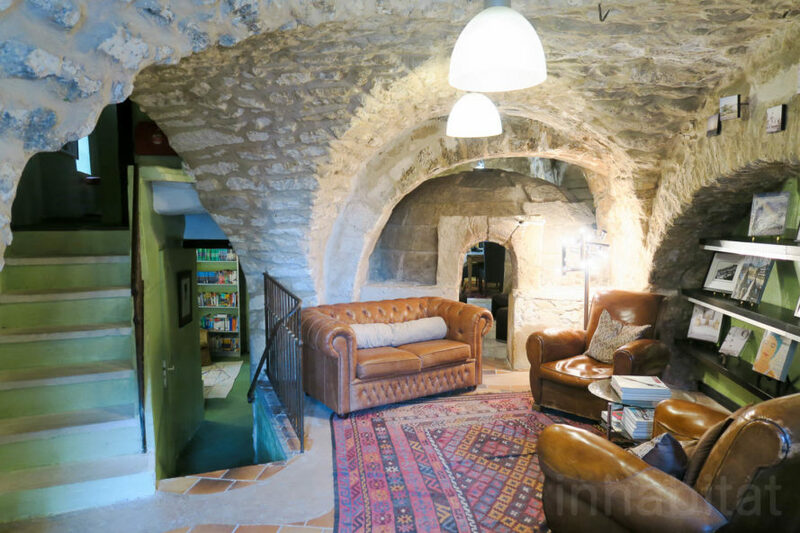 On Rue Basse, the main cobblestone road of Lacoste, sits the Olivier Caves, medieval caves that have been restored and outfitted into working studios for artist residences to carry on Provence’s great atelier tradition. Interior of the beehive oven turned into a reading nook. 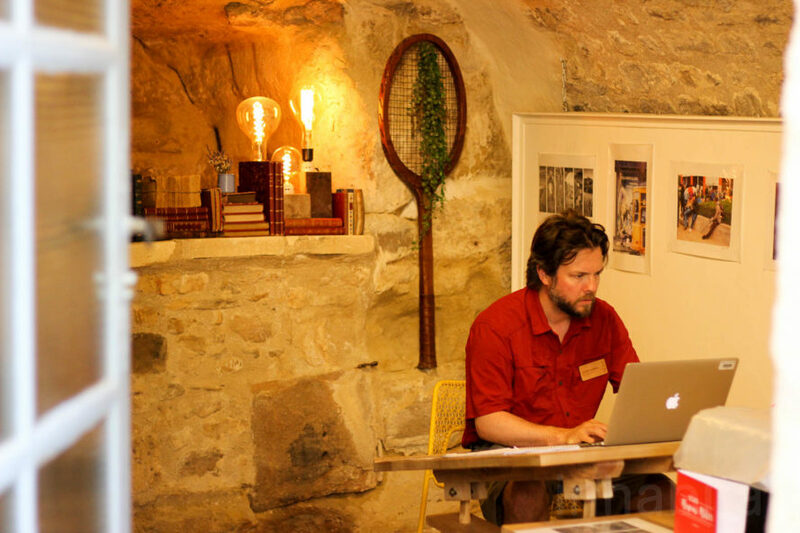 One great example of their success is the adaptive reuse of the 1840s boulangerie located at the heart of the village into SCAD’s library, which continues the boulangerie’s purpose as the “village hearth” and gathering space. 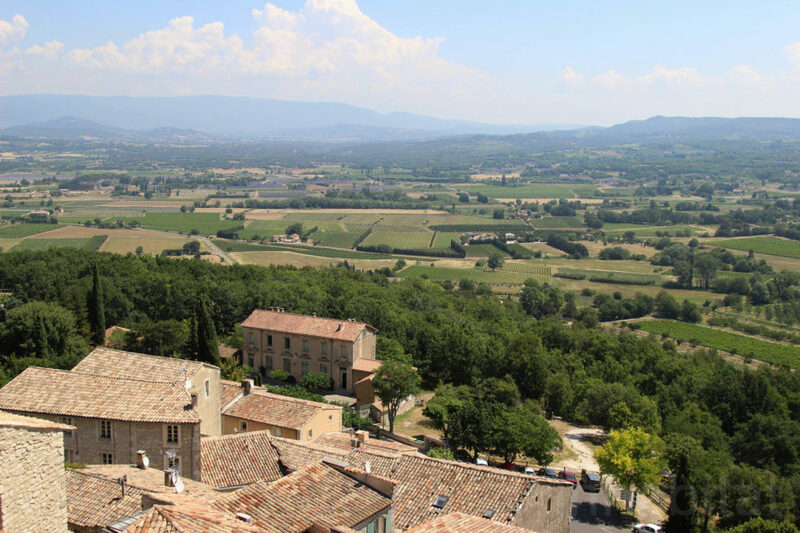 View from SCAD library out towards Luberon valley. ShopSCAD is a small on-campus shop where visitors can purchase student art. The beehive oven from the old boulangerie. SCAD Lacoste invites no more than eighty SCAD students to study at the beautifully preserved medieval village every quarter. The armory transformed into an auditorium. Perhaps the best place to see the confluence of contemporary art and historic preservation is in Maison Basse, a former farmhouse in the valley that is SCAD’s most extensive restoration project to date. The building, which houses a cafeteria, living rooms, studios, and student housing, features a tasteful and elegant mix of local vintage furnishings, historic relics found on site, and SCAD artwork in every room. One of many computer labs. Artist studio at Maison Basse. Modern amenities, such as plumbing, electricity, WiFi, computer labs, and more have all been integrated into the campus without disturbing the historic character. Visitors in Provence are also free to visit the grounds and attend guided tours. Adaptive reuse is a core theme found throughout not just on the Lacoste campus, but also on all SCAD campuses including those in Atlanta, GA; Savannah, GA; and Hong Kong. View of Maison Basse from SCAD Lacoste. New discoveries continue to be made with every excavation, from unearthed 3rd century Roman glass relics to sprawling underground tunnels beneath Rue Basse. SCAD has thus far restored over 30 buildings, though the number is not exact since many structures are merged together and unexpected rooms and spaces are uncovered during restoration work. 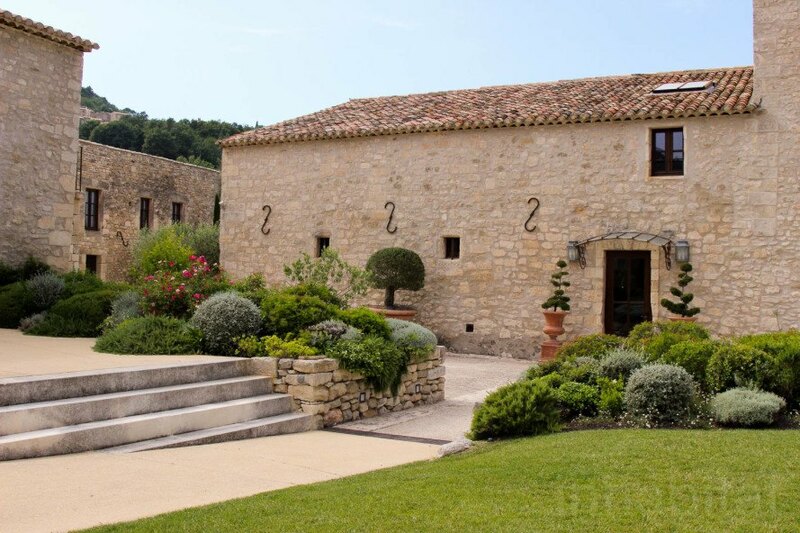 Traditional building methods and locally quarried Luberon stone are used in repairs wherever possible. While the village’s architectural character is preserved and respected, SCAD injects new life into the stone buildings with colorful lush landscaping and contemporary student artwork that tastefully punctuate Lacoste.